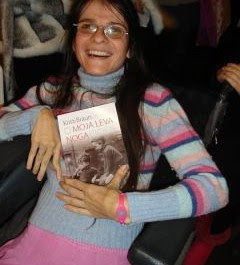 Pictured is Mima Ruzicic-Novkovic, leader of Centre Living Upright in Serbia. June 2013 - Towson University’s Department of Mass Communication & Communication Studies and its Hussman Center for Adults with Autism have been selected to participate in a U.S. Department of State sponsored Professional Fellows EMPOWER Program, administered by Mobility International USA (MIUSA). This two-way international exchange program aims to expand the capacity of organizations in the U.S. and abroad to promote inclusive communities and advance the rights of persons with disabilities around the world. Towson University has partnered with two Serbian-based organizations, Centre Living Upright and the Novi Sad Journalism School, to implement a long-term project on the use of traditional and social media platforms as tools to advance the rights of persons with disabilities in Serbia. In August 2013, Towson University will send Rhonda Greenhaw, Director of the Hussman Center for Adults with Autism at Towson University, to Serbia for a preliminary exchange visit with the partnering organizations to gain an understanding of disability access and inclusion in their communities, as well as to lay the foundation for a collaborative project and effective international relationship. One representative from each Serbian organization will then be hosted by Towson University October 19-29, 2013, where they will work alongside American counterparts to gain first-hand experience on how issues in their field are addressed in the United States. Part of this exchange will include interactive trainings on ways to create and disseminate effective media messages surrounding disability rights. Emphasis will be placed on the use of social media to advocate for the inclusion of individuals with disabilities in all sectors of society. Towson University is one of 20 U.S.-based organizations and institutions competitively selected to host approximately 60 disability rights leaders from 40 international organizations in 20 different countries. Projects range from inclusive education, independent living, healthcare and reproductive rights, law and policy, legal aid, recreation and sports, access to public services, and advocacy for youth, women, and minority disability groups. Learn more about the 20 projects and teams here. At the conclusion of the fall 2013 Professional Fellows EMPOWER Program, all overseas participants and their U.S. hosts will gather in Washington, D.C., for a three day conference at Gallaudet University, Oct. 31- Nov.2. Participant will have the opportunity to network with other leaders in their field, and share plans for long-term projects that will be implemented upon their return home. The Professional Fellows EMPOWER Program is a series of four separate two-way exchanges funded by the U.S. Department of State’s Bureau of Educational and Cultural Affairs, and implemented by U.S. organizations American Councils for International Education, Discovering Deaf Worlds, Global Deaf Connections, and MIUSA. At the conclusion of the EMPOWER Programs in November 2013, an estimated 75 international disability rights leaders from every geographic region will have come to the United States for two-to-four week professional development programming, and approximately 57 American stakeholders will have traveled abroad for reciprocal exchanges. Towson University’s Department of Mass Communication and Communication Studies focuses on the study of the structure, processes, aesthetics, functions, ethics and criticism of mass media and human communication. The department provides students with broad and diverse course work in advertising, journalism and new media, public relations, and communication studies. The U.S. Department of State’s Bureau of Educational and Cultural Affairs (ECA) supports two-way international exchange programs that increase mutual understanding between the people of the United States and countries around the world. Programs range from sports exchanges, youth exchanges, cultural exchanges, and professional exchanges. Approximately 50,000 individuals take part annually in exchange programs managed by ECA. Mobility International USA is a non-profit organization whose mission is to empower people with disabilities around the world to achieve their human rights through international exchange and international development. Since 1981, MIUSA has offered international exchange programs to over 2,000 youth, adults, and professionals with and without disabilities from more than 110 countries.